Home » Pages from a Disney Book » Frozen Sisters Anna and Elsa Moving to Magic Kingdom on April 20! 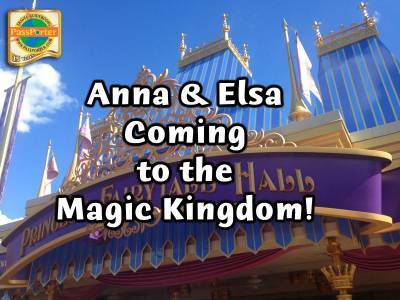 Frozen Sisters Anna and Elsa Moving to Magic Kingdom on April 20! I’m pleased to discover today that the popular sisters from Disney’s “Frozen” are moving! Many PassPorter members have reported VERY long lines at the Norway Pavilion, so this is a very welcome change. Anna and Elsa will be at the lovely Princess Fairytale Hall in Fantasyland which has FastPass+, so this should really cut down on wait times. The sisters move in April 20, 2014 and should be available during the day, departing in the early evening to make way for other princesses. If this princess encounter is important to you or your little ones, be sure to get your FastPass+ reservations made quickly, as I predict this will be a hot ticket. Of course, if you don’t want to wait in ANY lines, you can see Anna and Elsa on The Princess Garden float daily during the new Disney Festival of Fantasy Parade, also in the Magic Kingdom! 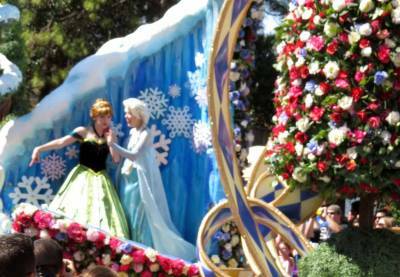 Princesses Anna and Elsa in The Princess Garden float in the Disney Festival of Fantasy ParadeMany thanks to ladyt for breaking the news on the PassPorter Message Boards this morning! Jennifer Marx is the author of more than 50 travel guides and the recipient of more than a dozen awards. She is also the co-founder and co-creator of PassPorter.com, an active community of enthusiastic travelers. Her amazing son, Alexander, is the subject of many of her posts and thoughts on family travel. You can find her on Facebook, Twitter, Instagram, and Google+. ← Trip PinUp #1 – Planning Your Adventure to Walt Disney World: Pinterest Love!